Ferrari is an Italian manufacturer of racing cars and high-performance sports cars formed by Enzo Ferrari in 1929. 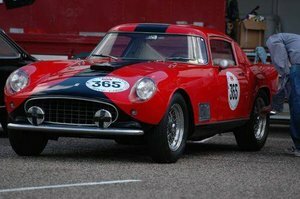 At first, Scuderia Ferrari sponsored drivers and manufactured racecars; the company went into independent car production in 1946, eventually became Ferrari S.p.A., and is now controlled by the Fiat group. The company is based in Maranello, near Modena, Italy. Ferrari founder Enzo Ferrari never intended to produce road cars when he formed Scuderia Ferrari in 1929 as a sponsor for amateur drivers headquartered in Modena. Ferrari prepared and successfully raced various drivers in Alfa Romeo cars until 1938, when he was officially hired by Alfa as head of their racing department. In 1940, upon learning of the company's plan to absorb his beloved Scuderia and take control of his racing efforts, he quit Alfa. Because he was prohibited by contract from racing for several years, the Scuderia briefly became Auto Avio Costruzioni Ferrari, which ostensibly produced machine tools and aircraft accessories. Ferrari did in fact produce one racecar, the Tipo 815, in the non-competition period; it was thus the first actual Ferrari car, but due to World War II it saw little competition. In 1943 the Ferrari factory moved to Maranello, where it has remained ever since. The factory was bombed in 1944 and rebuilt in 1946 to include a works for road car production. "Scuderia Ferrari" literally means "Ferrari Stable" in keeping with the prancing horse emblem; the name is figuratively translated as "Team Ferrari." The first Ferrari road car was the 1947 125 S, powered by a 1.5 L V12 engine; Enzo reluctantly built and sold his automobiles to fund the Scuderia. While his beautiful and blazingly fast cars quickly gained a reputation for excellence, Enzo maintained a famous distaste for his customers, most of whom he felt were buying his cars for the prestige and not the performance value. Ferrari road cars, noted for their exquisite styling by design houses such as Pininfarina, have long been one of the ultimate accessories for the rich and young (or young-at-heart). Other design houses that have done work for Ferrari over the years include Scaglietti, Bertone, Touring, Ghia, and Vignale. Ferrari cars feature highly-tuned small V8 and V12 engines, often in a mid-engined configuration; until the introduction of fuel injection in the 1980s, they were quite temperamental. Until the mid-1980s they carried a reputation for unreliability and bad engineering, though these were written off by enthusiasts as "character." Ferrari owners have famously and religiously defended the merits of their cars while virulently criticizing other brands. As of 2004, FIAT owns 56% of Ferrari, Mediobanca owns 15%, Commerzbank owns 10%, Lehman Brothers owns 7%, and Enzo's son Piero Ferrari owns 10%. Enzo Ferrari's true passion, despite his extensive road car business, was always auto racing. His Scuderia started as an independent sponsor for drivers in various cars, but soon became the Alfa Romeo in-house racing team. After Ferrari's departure from Alfa, he began to design and produce cars of his own; the Ferrari team first appeared on the European grand prix scene after the end of World War II. The Scuderia joined the Formula One World Championship in the first year of its existence, 1950. José Froilán González gave the team its first victory at the 1951 British Grand Prix. Alberto Ascari gave Ferrari its first World Championship a year later. 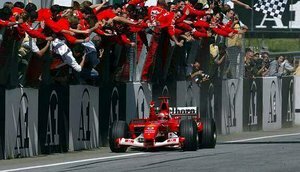 Ferrari is the oldest team left in the championship, not to mention the most successful: the team holds nearly every Formula One record. As of 2004, the team's records include fourteen World Drivers Championship titles (1952, 1953, 1956, 1958, 1961, 1964, 1975, 1977, 1979, 2000, 2001, 2002, 2003 and 2004), fourteen World Constructors Championship titles (1961, 1964, 1975, 1976, 1977, 1979, 1982, 1983, 1999, 2000, 2001, 2002, 2003 and 2004, 179 grand prix victories, 3445 and a half points, 544 podium finishes, 174 pole positions, 11,182 laps led, and 180 fastest laps in 1622 grands prix contested. Famous drivers include Tazio Nuvolari, Juan Manuel Fangio, Alberto Ascari, Phil Hill, Mike Hawthorn, John Surtees, Niki Lauda, Jody Scheckter, Gilles Villeneuve, Nigel Mansell, Alain Prost and Michael Schumacher. The famous symbol of Ferrari is a black prancing horse on yellow background, usually with the letters S F for Scuderia Ferrari. The horse was originally the symbol of Count Francesco Baracca, a legendary "asso" (ace) of the Italian air force during World War I, who painted it on the side of his planes. Baracca died very young on June 19, 1918, shot down after 34 victorious duels and many team victories; he soon became a national hero. 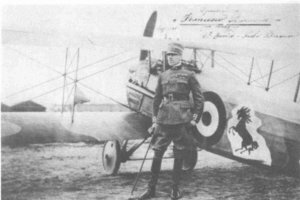 Baracca had wanted the prancing horse on his planes because his squad, the "Battaglione Aviatori", was enrolled in a Cavalry regiment (air forces were at their first years of life and had no separate administration), and also because he himself was reputed to be the best cavaliere of his team. It has been supposed that the choice of a horse was perhaps partly due to the fact that his noble family was known for having many horses on their estates at Lugo di Romagna. Another theory suggests Baracca copied the rampant horse design from a shot down German pilot who had the emblem of the city of Stuttgart on his plane. This is supported by the evidence that Barraca's horse looks more similar to the one of Stuttgart (not changed since 1938) than the current Ferrari design, especially as the legs of the horses are concerned. Interestingly, rivalling German sports car manufacturer Porsche designed its logo by embeddeding the prancing horse logo of Stuttgart into the emblem of the state of Württemberg, just like the city is placed within the state. In the 1920s, Ferdinand Porsche had constructed supercharged cars for Mercedes-Benz in Stuttgart before starting his own engineering company there in the 1930s, designing the Auto Union race cars, amongst others. Curiously, the name Stuttgart is derived from Stutengarten, an ancient form of the modern German word Gestüt, which translates into English as stud farm and into Italian as scuderia. In turn, the Italians call Stuttgart Stoccarda. Obviously, the Ferrari-led Alfa team often met the Silver Arrow teams of Mercedes-Benz (from Stuttgart itself) and later Auto Union at race tracks in the 1920s and 30s, so each knew of the other. On June 17, 1923, Enzo Ferrari won a race at the Savio track in Ravenna where he met the Countess Paolina, mother of Baracca. The Countess asked that he use the horse on his cars, suggesting that it would grant him good luck, but the first race at which Alfa would let him use the horse on Scuderia cars was eleven years later at SPA 24 Hours in 1932. Ferrari won. Ferrari left the horse black as it had been on Baracca's plane; however, he added a canary yellow background because it was the symbolic color of his birthplace, Modena. The prancing horse has not always been uniquely identified with the Ferrari brand: Fabio Taglioni used it on his Ducati motorbikes. Taglioni's father was, in fact, a companion of Baracca's and fought with him in the 91st Air Squad. But, as Ferrari's fame grew, Ducati abandoned the horse; this may have been the result of a private agreement between the two brands. The prancing horse is now a trademark of Ferrari. V6 and V8 models used the total displacement (in deciliters) for the first two digits and the number of cylinders as the third. Thus, the 206 was a 2.0L V6-powered vehicle, while the 348 used a 3.4L V8. V12 models used the displacement per cylinder (in cubic centimeters) for all three digits. Therefore, the famed 365 Daytona had a 4380cc engine (365 times 12). GTS models, in older models, are convertibles (see 365 GTS4); however, in late models, this suffix is used for targa top models (see 348 GTS, and F355 GTS; exception being the 348 TS, which is the only targa named differently). The convertible models now use the suffix "Spider" (see F355 Spider, and Ferrari 360 Spider). This naming system can be confusing, as some entirely different vehicles used the same engine type and body style. Many Ferraris also had other names affixed (like Daytona) to identify them further. Many such names are actually not the car's official name given by the factory. The 365 GTB4 model only became known as a Daytona after racing variants run by N.A.R.T. (North American Racing Team, who raced Ferrari's in America) won the famous 24 hour race of the same name. As well, the 250 GTO's famous acronym, which means Gran Turismo Omologato, was simply a name the Italian press gave the car which referred to the way Ferrari had, in a sense, avoided the rules and successfully homologated the car for racing purposes (Ferrari had convinced the FIA, somehow, someway, that the 250 GTO was the same car as previous 250's). This was done probably to avoid confusion with the multiple 250 models which were produced before the GTO. The Dino was the first mid-engined Ferrari. This layout would go on to be used in most Ferraris ofthe 1980s and 1990s. V6 and V8 Ferrari models make up well over half of the marque's total production. Ferrari entered the mid-engined 12-cylinder fray with the flattened Berlinetta Boxer in 1971. The later Testarossa remains one of the most famous Ferraris.